Your donation will help develop and perfect atomic and molecular testing techniques that could answer every outstanding issue regarding the Shroud of Turin. Science could demonstrate that a miraculous event happened that is tantamount to the Resurrection. What if Jesus Christ's dead, crucified body miraculously gave off particle radiation from its length, width and depth as it disappeared? What if this event occurred as he laid in his burial shroud inside of his tomb? What if this happened after he was beaten, crowned with thorns, crucified and killed? Scientists and experts at Test the Shroud Foundation contend that if this burial shroud was tested at the atomic and molecular levels, several key events in history could be proven. 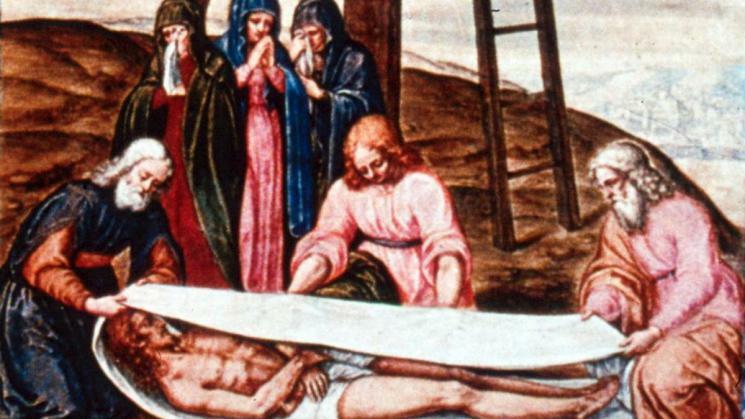 It could be shown by billions of items of unfakable evidence that particle radiation emanated from the length, width and depth of the tortured, crucified, dead body wrapped in the Shroud of Turin. This event would be consistent with all other objective evidence acquired from this famous burial cloth and would absolutely refute its controversial C-14 dating performed in 1988. These advanced scientific techniques could not only demonstrate whether such a miraculous event occurred, but when it happened; where it happened; the actual age of this cloth and its bloodstains; and the identity of its victim. Test the Shroud Foundation is a nonprofit, tax-deductible corporation that has sponsored and published several important research and scientific testing projects in connection with the Shroud of Turin. It is currently developing and perfecting advanced scientific testing techniques to determine whether the above radiating event miraculously occurred to the crucified corpse in the Shroud and the surrounding circumstances of time, place, instruments, executioners and the victim's identity.